In the boat and yachting electrical world, it is not enough to merely strip the insulation off the end of a wire and wrap it around a screw that gets tightened. Wire terminals are the approved method of connecting wire ends to the source of electricity and to electrical devices that require it. Marine wire has specific qualities that make it superior for use on boats and yachts. Marine wire should be finely stranded copper, for flexibility, as marine wiring must be able to survive long periods of vibration without failure. The individual strands making up the wire should to be tin plated to resist corrosion. The wire insulation must be able to withstand the heat, moisture, salt, fuel, oil, acid, and abrasion which are usually present in this harsh environment. Marine wire terminals also should be made of copper, and have tin plating for corrosion resistance. Marine wire terminals should be insulated and of the crimp-on type electrical connection. The wire terminal must be selected to match the size (gauge) of wire being used. In the smaller wire terminal sizes, the terminals are often color coded, RED for 22-18 ga., BLUE for 16-14 ga., and YELLOW for 10-12 ga. Always use the correct sized terminal for the wire gauge being used. When using ring terminals, always select the correct ring terminal for the size of the fastener used to attach the terminal. It is important to maximize the surface area between the terminal fastener and the wire terminal itself to improve the current carrying capacity of the wire and terminal connection. A 3/8” ring terminal attached to a #10 screw doesn’t allow much surface area for the current to flow and has little resistance to bending or vibration. It is possible to modify the size of the ring terminal on some of the larger sizes. A 2/0 x ¼” ring terminal can be drilled out with a step drill to a 5/16”, 3/8”, or larger. However, drilling out the terminal will remove the tin plating on the inside of the hole, which compromises the anti-corrosion properties of the plating. There are actually two connections that need to be made for each wire terminal. The first is the ELECTRICAL connection, which is made by crimping the middle part of the terminal sleeve to the bared wire strands with the appropriate section of the crimping tool. This section is usually labeled or color coded for the specific terminal size being used. The second is the MECHANICAL connection, made by either crimping the end of the terminal sleeve to the insulation at the end of the wire before the bared strands with the appropriate section of the crimping tool, or by heating the adhesive lined heat shrink tubing around the terminal and wire end insulation. It is essential to make the electrical crimp connection with enough force to tightly bond the terminal to the wire strands of the bared wire end. There should not be any play or wiggle between the terminal and the wire it is crimped to. It should be very difficult or impossible to pull the wire out of the terminal after it has been crimped to the wire end. The mechanical connection is important because it moves the strain of flexing and vibration between the copper wire strands and the terminal to the connection of the terminal to the insulation, preventing the copper strands from work hardening and breaking when subjected to vibration and/or flexing. The mechanical connection may be a second crimp to a crimping sleeve built into the terminal designed to crimp against the wire insulation. This connection uses a different section of the wire crimp tool than the electrical connection section. This section has a larger “hole” when closed, and allows the mechanical sleeve in the terminal to be crimped to the wire insulation without crushing the terminal as much as with the electrical connection crimp. 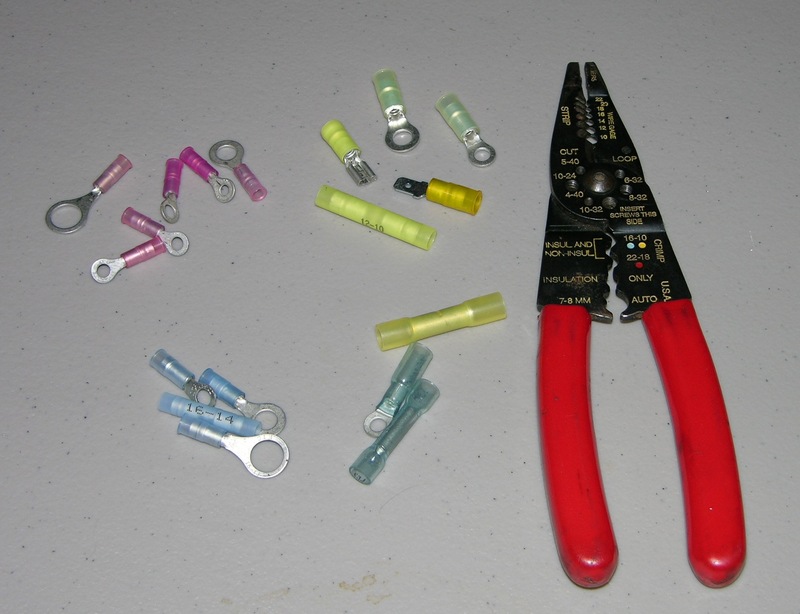 Another method of making the mechanical connection is with crimp-on terminals supplied with adhesive lined heat shrink tubing. 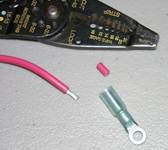 The electrical crimp connection is the same, but the mechanical connection is made by shrinking the terminal heat shrink insulation around the terminal electrical connection using a heat source such as a heat gun or small flame. Be careful not to over heat the tubing if using a flame. Hold the flame about an inch or so below the terminal connection and roll the terminal over the flame to evenly warm the heat shrink tubing. Smoking and blackening is a sign of overheating or heating too quickly. The heat will shrink the tubing to form a tight seal, and when enough heat has been applied the adhesive can usually be seen oozing out from the ends of the insulation. The heat shrink process adds the benefit of very good water protection at the wire termination. If the terminal being used is of the type without heat shrink and without a mechanical crimp connection, a short length of the appropriate sized adhesive lined heat shrink tubing should be placed over the end of the wire before the terminal is crimped, and heated to shrink around the terminal electrical connection and the wire insulation after crimp has been made. This will provide the necessary mechanical connection to the wire insulation as well as add water protection to the wire end and terminal. Blue Sea Systems continues to be a leading manufacturer of electrical panels and electrical components for boaters; whether building new or refitting your boat. Go2marine supplies electrical products for powerboats or sailboats as well as commercial and fishing vessels. The Blue Sea name is synonymous with quality marine electrical products. There is a crafted Blue Sea marine electrical distribution panel to fit every need. Panels are available in AC (alternating current, 110 volts), DC (direct current, 12 volts), a combination of AC/DC as well as waterproof DC panels. As years have gone by, boats have increased in their electrical complexity with the addition of GPS, computers, LED lights and other systems. Blue Seas panels help the average boat owner when doing an electrical panel replacement or installation. Benefits include increased electrical safety as well as updating the panel for the demand in modern electrical use. DC Weather and Water Resistant Distribution Panels for cockpit, helm and spray situations. Blue Sea panels are easy to use and modify. There are circuit breakers available to fill open positions left in panels for customization or to replace breakers with ones that more approximate your panel requirements. Thermal circuit breakers combine switching and circuit protection. Typical uses for these are as a switch / breaker to a downrigger, electric outboard, winch or any electric motor. Use in any location where power is coming directly from the battery to an electrical device. These thermal circuit breakers are waterproof and vaporproof and may be used aboard gasoline powered boats with no risk of spark. Most modern boats of any size have a battery switch. In a simple system, the battery switch just cuts the electricity from the batteries to the engine, or the “house” (the term for batteries that run the boat electrical systems other than the engine) or both. As boats get larger, they may use more than one for a variety of reasons. The power coming from a group of batteries is sorted out into banks, for the house and engine. Add to this a separate generator starting battery, inverter and battery charger and you may have more than one switch to direct all the different power sources to the distribution panels or applications. Blue Sea Systems manufacturers a battery selector switch for any application. Wesmar Bow and Stern Thrusters are an all stainless steel design. A low maintenance design is assured with polished stainless props, stainless steel casings and stainless steel seal and bearing carriers. Wesmar’s Bow and Stern thrusters are designed for low maintenance with extremely rugged and reliable operation, more thrust from the motor horsepower, easy of retrofitting or upgrading as well as precise operator control. Wesmar’s new line of all stainless steel double propeller bow and stern thrusters is based on over 40 years experience in the ocean. From luxury yachts to commercial fishing vessels, some working in midwinter Arctic and Antarctic waters, Wesmar has been manufacturing rugged, reliable bow and stern thrusters. Wesmar’s Customer Satisfaction Report is available as a PDF. From mega yachts to work vessels to tour boats. Wesmars counter rotating dual propeller thrusters design was invented by Wesmar. The counter rotating propellers provide 40% more thrust from the same tunnel and input power over a single propeller design. Wesmar Thruster are available from Go2marine in Direct Drive DC and Hydraulic Drives. Special orders can be fitted with Proportional DC Drive, AC Electric Drive and fitted for Central Hydraulics. Direct Drive DC Electronic – (6 to 12 inch Thrusters), Two motor sizes with standard solenoid switch on/off control. Hydraulic Drive – with load sense pumps, piston motors, proportional control valves, high and low pressure filtering, various sensing devices and a variety of tanks to fit vessels space requirements. Wesmar Thrusters are available from 5 to 350 Horsepower and from 6″ to 42″ propellers for vessels from 25 to 250+ feet. Custom orders are available. Contact Go2marine to discuss your application.